This is where I show off my most recent purchase, usually using "seller" photographs, so be warned about the quality! 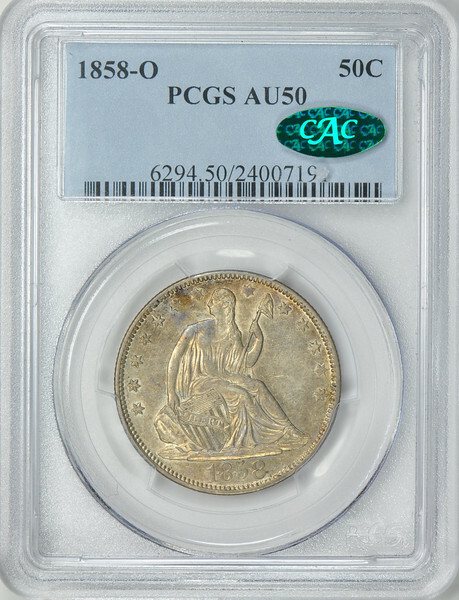 COIN: 1854 GOLD DOLLAR - TYPE 2 graded by NGC as AU55 and approved by CAC with a green sticker. COIN: 1838 SEATED LIBERTY DIME, with NO DRAPERY LARGE STARS graded by NGC as AU55 and approved by CAC with a green sticker. COMMENTS: First coin of 2015! 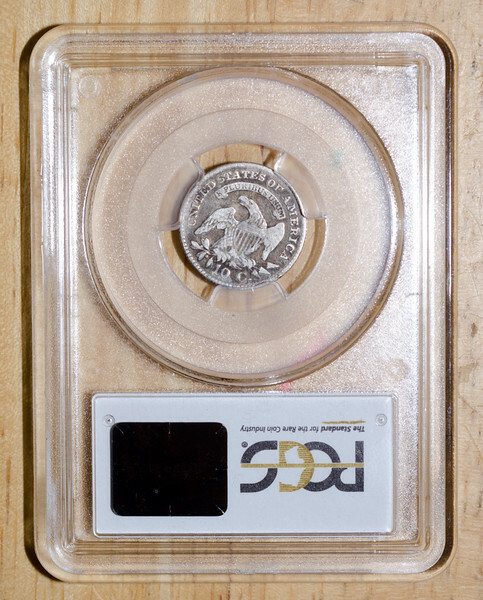 This is the third coin I have purchased from a fellow collector / vest-pocket dealer from the CAC / CT / PCGS forums. 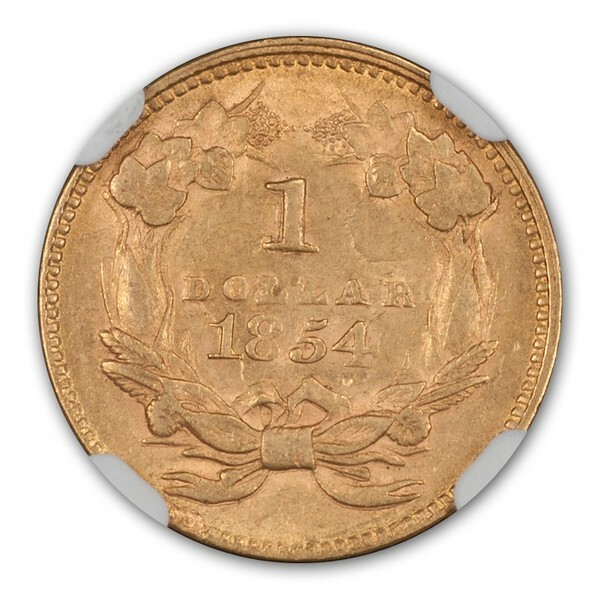 This coin was submitted to CAC by this person, who purchased it from Gerry Fortin (site here). Gerry listed it as F-110, which does not have the spectacular die break as the F-110A which is labeled by NGC and others. Note the die crack on the Obverse from the right of the shield, through the skirt hears Liberty's foot, and off the coin at 4 o'clock. Listed by Gerry as an R4. 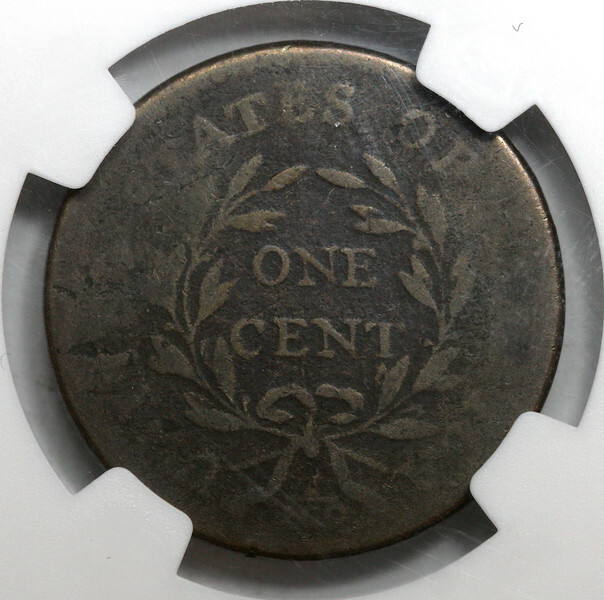 Clashing mark on the reverse near the 'ME' of DIME. See Gerry's page here for more 1838 10C f110 details. Overall, a very pleasing AU coin with some nice flash in the correctly angled light, and some pleasing crud around the devices on the top right and bottom of the Obverse. 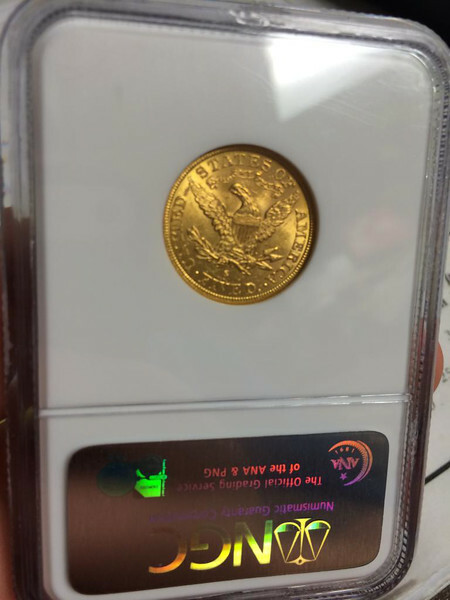 As always, I use the Sellers photos in the "NEWP" section of this site to show visitors exactly what I see when buying a coin from an online seller. 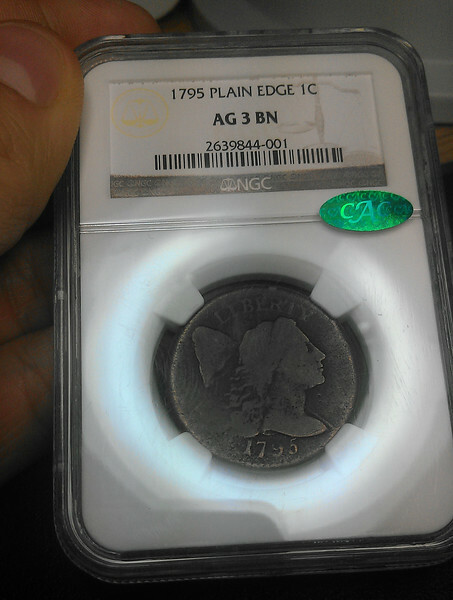 COIN: 1795 LIBERTY CAP CENT with PLAIN EDGE graded by NGC as ABOUT GOOD 3 and approved by CAC with a green sticker. DEAL COMMENTS: Partial trade + Cash to a fellow CoinTalk member. 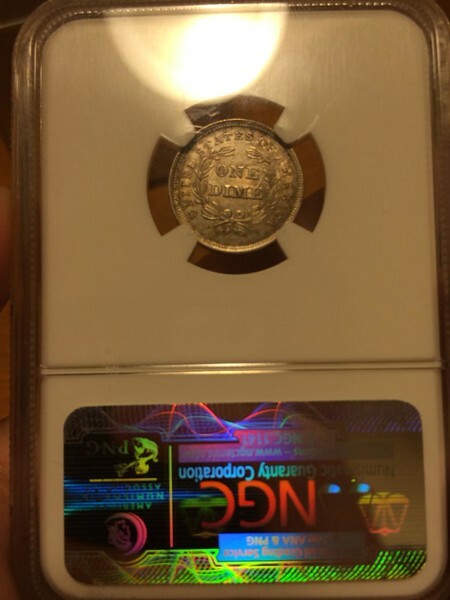 This member reached out to me offering this coin based on a comment I made in a thread on CoinTalk. Goes to show there are a variety of benefits of participating online. 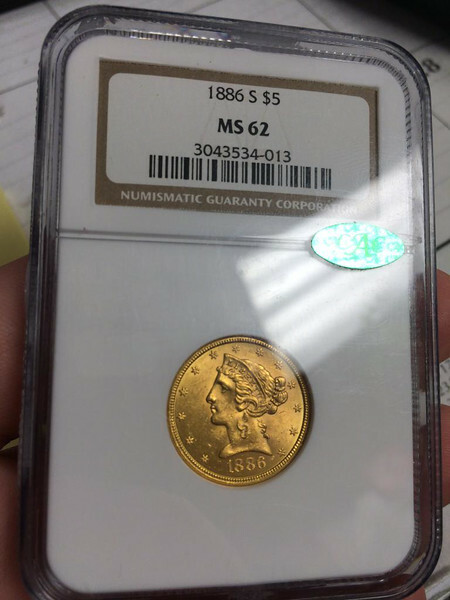 This member was able to sell his coin without any fuss, as he had recently upgraded it, and I was able to get a coin I need for my Type Set which was of much higher quality than other CAC approved examples on eBay. I did not get this coin for a "deal", but paid a strong price which was helped by the fact that the seller agreed to take my last two coins I was trying to sell in trade for this coin. Effectively I killed two birds with one stone! COIN COMMENTS: Very nice for the grade! 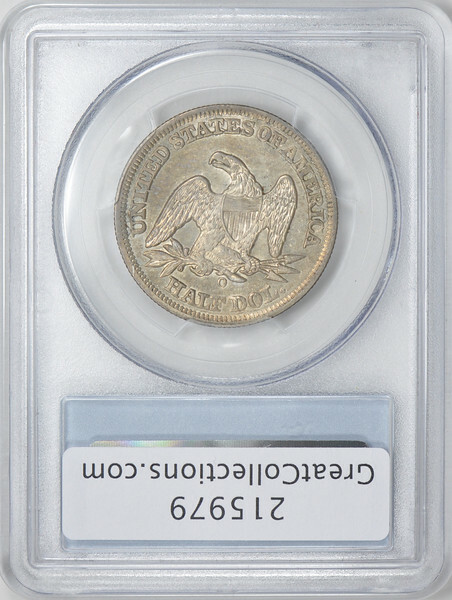 There was the same coin, same grade, and also CAC approved on eBay, and that coin is not nearly as nice as this example. This is almost a G4, and with very smooth surfaces compared to most porous G3 coppers. There is a hairline scratch from Liberty's head down in front of her nose, but it is not so noticeable in hand. COINS: 1976 S KENNEDY, SILVER-CLAD HALF DOLLAR graded by PCGS as MS65 and 1976 S WASHINGTON, SILVER-CLAD QUARTER DOLLAR graded by PCGS as MS65. 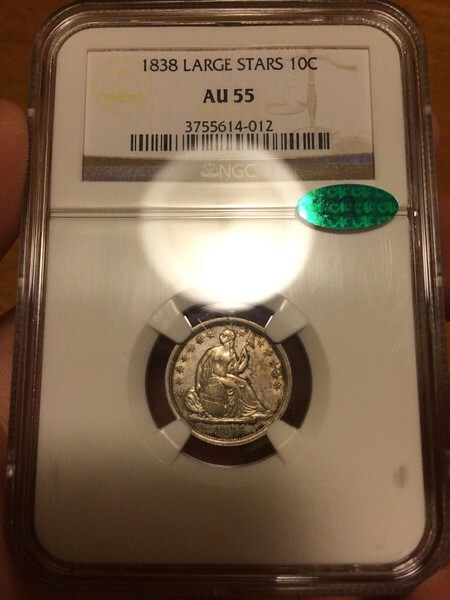 COMMENTS: Purchased from a PCGS Forum member based on a for-sale ad listed there. 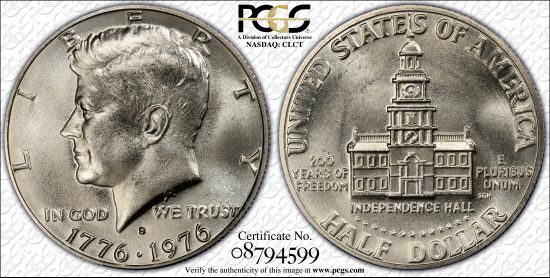 I fell in love with the PCGS CoinFacts photo of the Kennedy, and needed the type for my set along with the Washington Quarter. I wanted a nice GEM grade, but not a 68 or higher with the price jumps. Both of these coins are NOT Types approved by CAC. Both are mostly blast white and pleasing. There are two parallel marks near the nose of the quarter, but nothing else major. 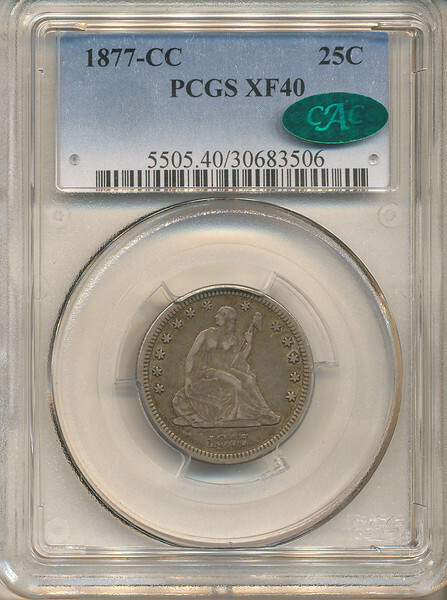 COIN: 1877-CC SEATED LIBERTY QUARTER DOLLAR with MOTTO graded by PCGS as XF40 and approved by CAC with a green sticker. COMMENTS: Purchased from Bozarth Numismatics, one of my top recommended coin sellers. Another very easy transaction for a great Type coin. 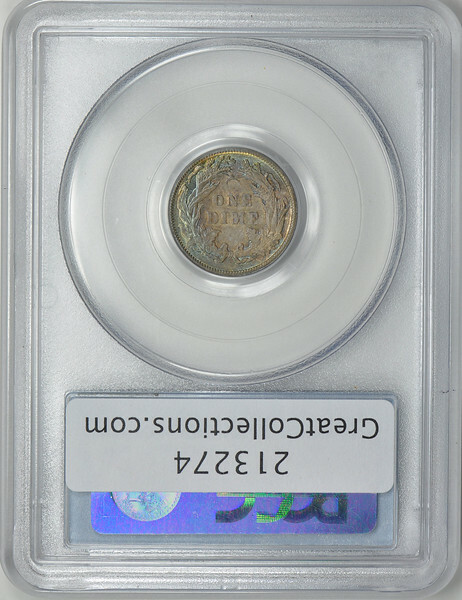 Coin look much better in-hand than seller photos, with some nice color. 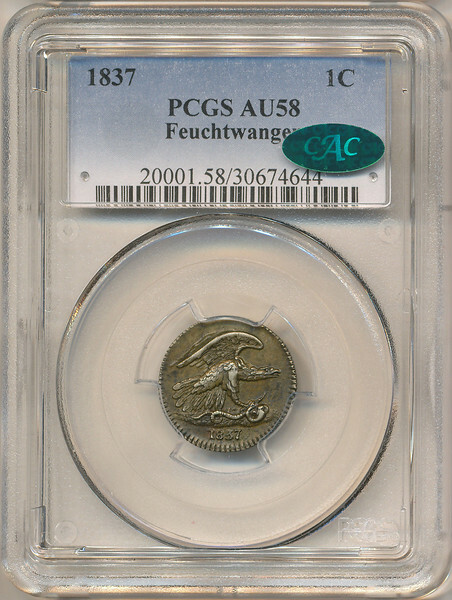 COIN: 1837 1C HARD TIMES TOKEN, NEW YORK FEUCHTWANGER COMP graded by PCGS as AU58 and approved by CAC with a green sticker. 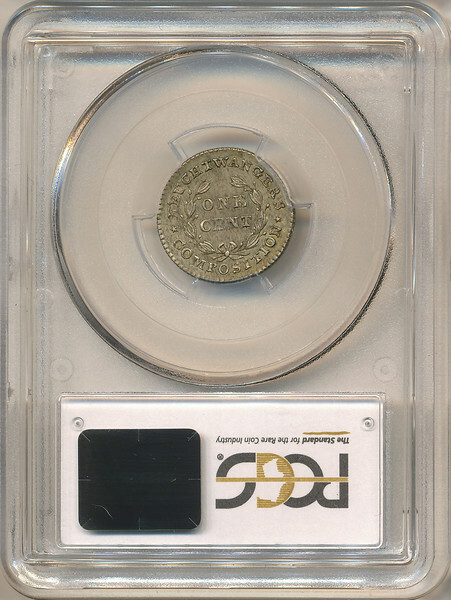 COIN: 1858 SEATED LIBERTY HALF DIME with STARS OBVERSE graded by NGC as AU58 and approved by CAC with a green sticker indicating solid (B-coin) or high-end (A-coin) for the grade. COMMENTS: A super PQ coin I had passed over a few month ago due to lack of funds. I tried making this deal as a trade, but I have very little left to trade. Seller had a 2x toning / PQ premium, which was too much for me. I knocked it down to about a 1.5x premium and pulled the trigger. He has told me I won't be disappointed! Based on the photos, I see absolutely no issues! I'm very much looking forward to get this one in hand. 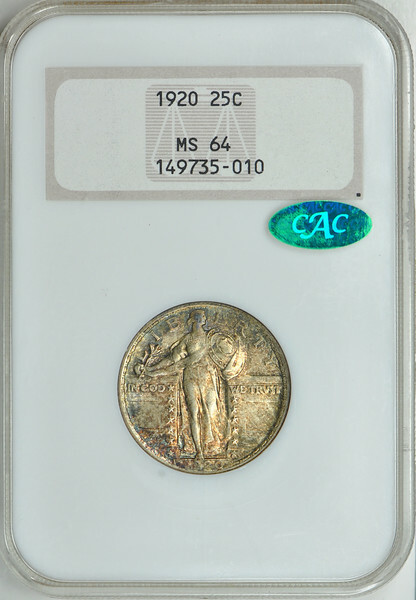 COIN: 1920 STANDING LIBERTY QUARTER DOLLAR, TYPE 2A graded by NGC as MS64 and approved by CAC with a green sticker indicating solid (B-coin) or high-end (A-coin) for the grade. COMMENTS: Awesome toning and in my favorite TPG holder, an NGC no-line "FATTY" ! No long ago, I thought there was only two types in the SLQ series. Was I wrong! 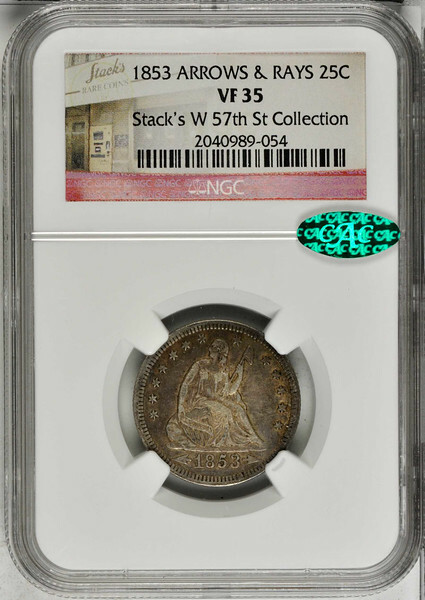 A friend told me NGC recognized three types, which I confirmed, and I also check PCGS CoinFacts, and they recognize a Type 2a and a Type 2b coin. So, I needed to fill this newly created whole in my Type Set. A few months later, here you go, a super PQ coin at a very reasonable price. The only downside that I can see if there appears to be mold on the NGC label. Full rivets on the shield and mostly full head by my judgment. NO hit / scratch issues to write about. 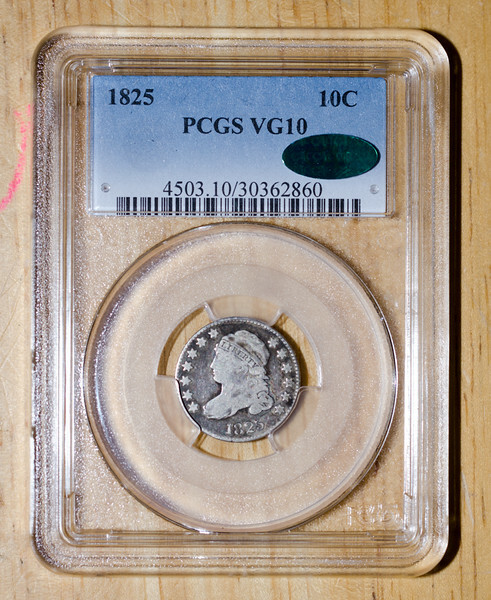 COIN: 1825 DIME - CAPPED BUST, LARGE SIZE graded by PCGS as VG10 and approved by CAC with a green sticker indicating solid (B-coin) or high-end (A-coin) for the grade. COMMENTS: This coin was acquired as a trade with a local collector / friend of mine for some coin-photography and CAC submission work I do for him. Trade value of $90, which is full "retail" price, but I am very happy. Nice slight "circulated cameo" look, and no large scratches which are sometimes seen at this grade (including a coin or two I've seen approved by CAC). Toned-over finger print on the right side of the Obverse. Rim-hit on the lower-right side of the Reverse, to the right of the arrow heads. Nice even looking wear. 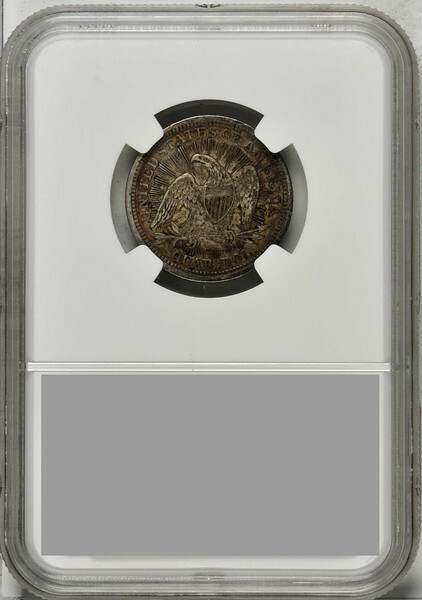 COIN: 1853 QUARTER DOLLAR - SEATED LIBERTY with ARROWS & RAYS graded by NGC as VF35 and approved by CAC with a green sticker indicating solid (B-coin) or high-end (A-coin) for the grade. COMMENTS: A very affordable Type coin in this grade. I love the Arrows & Rays varieties on US coins (really, it's just the Rays). This coin has darker toning, but still looks pleasing. Not exceptional, but for the price and grade I'm very happy. No major hits of concern, there is one on the right shoulder / breast area, and one on the skirt above the second 3 in the date. There is also a light scratch / line from the right elbow to the 4th star on the Obverse. I will check in detail when the coin arrives. Crud around most of the devices, "dirt in all the right places" as some people say. This represents another successful bid at StacksBowers Auctions. 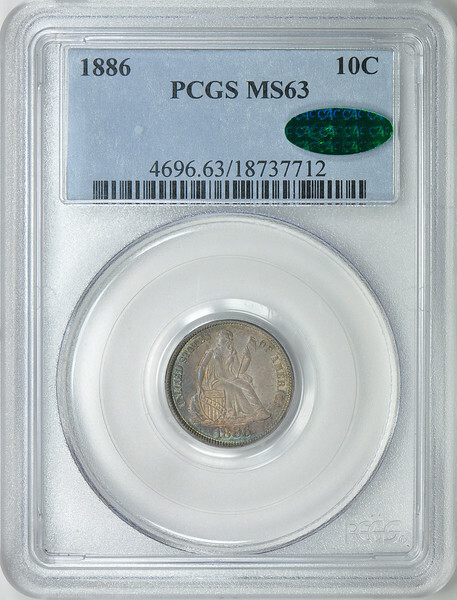 COIN: 1886 SEATED LIBERTY DIME with LEGEND OBVERSE graded by PCGS as MS63 and approved by CAC with a green sticker indicating solid (B-coin) or high-end (A-coin) for the grade. COMMENTS: I very nice example of the with "legend" Seated Dime. Original and pleasing with some great color on the bottom left of the Obverse and especially nice on the top Reverse and left Reverse. No major distracting marks to note. The strike looks a bit soft to me on he right reverse, but overall I am thrilled with this purchase from Great Collections Auctions. 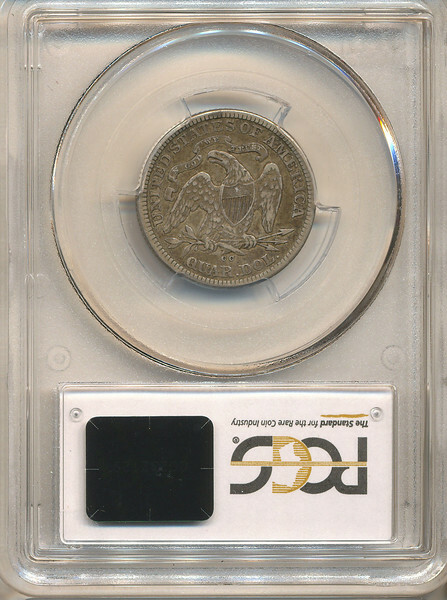 COIN: 1858-O SEATED LIBERTY HALF DOLLAR, "NO MOTTO, WITH DRAPERY" variety graded by PCGS as AU50 and approved by CAC with a green sticker indicating solid (B-coin) or high-end (A-coin) for the grade. COMMENTS: The top left of the obverse features from interesting "silvery" toning spilling over Liberty's right shoulder. I personally like this odd flash of color, but I could also understand if someone found it distracting. There is a somewhat noticeable horizontal gash to the right of Liberty's knee, which someone might equally find distracting. This hit is more noticeable in the supersize HA auction photos. The coin exhibits most of the original detail, and overall I find the champagne coloring and evenness of the wear quite pleasing, and that it should be included in my set as a great example of the "No Motto, with Drapery" Type. 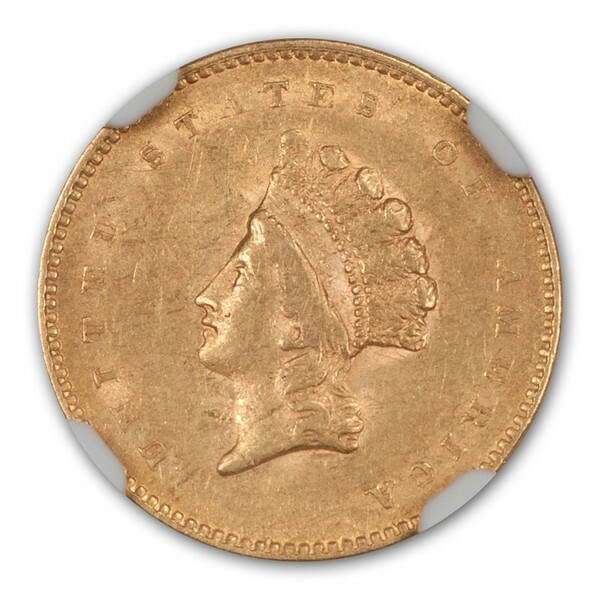 COIN: 1886-S Gold $5 HALF EAGLE - CORONET with "MOTTO" variety graded by NGC as MS62 and approved by CAC with a green sticker indicating solid (B-coin) or high-end (A-coin) for the grade. DEAL COMMENTS: My first major acquisition through a trade!! Normally, this coin would be way outside my price range and outside the goals of this set. But it just so happens that a fellow CAC forum member was browsing my want-list, saw a coin he had, and saw an opportunity to trade it out. At first it was going to be a slabbed Walking Liberty Half + cash on my part, but it evolved to be purely silver bullion, and a $50 check. That's right, I got this coin for $50 cash plus some ASE, 90% junk and a roll of BU 1964 Kennedy's. A fair deal all around. 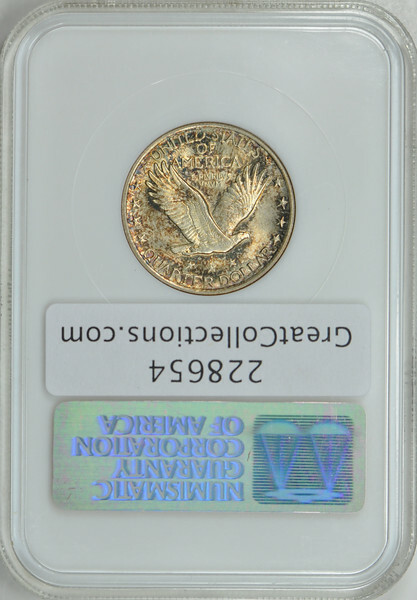 COIN COMMENTS: A great looking Type coin in an affordable grade. Not really any issues to write home about, just a solid coin for the grade with an attractive design. There are numerous hits on Obverse and Reverse, but nothing jarring or unexpected for MS62. A Yummy golden color.